ago. Within a month and a half, she earned back her entire investment. Shops on August 4 with a grand opening event on August 8, which is tax-free weekend. The shop is a women’s boutique and will also have clothing for little girls and plus sizes. artists from Oklahoma City and will have a line of dog products. business that’s opened a brick and mortar store. school. It’s what I pursued my degree in. It felt like this is the right time,” Crystal said. 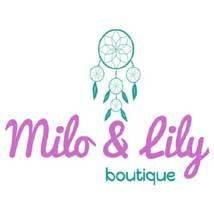 Milo & Lily’s Grand Opening is Aug. 8 10am-5pm – come for giveaways, mimosas and sales – Sip and Shop! Milo & Lily is located 9612 N. May Ave. Open Tuesday-Saturday; T-F:10-6, S:10-5. Milo and Lily are Crystal’s dogs. Milo is a Dachshund and Lily is an Akita.